Words to Sweat by is proud to introduce a new line of inspirational jewelry that keeps your fitness goals in fashion. The collection includes bracelets with colorful jersey knit cuffs, earrings that are easy to wear while you workout, and necklaces that keep your favorite health and fitness mantra or goal close to your chest. In celebration of this launch we are holding a giveaway to let several Words to Sweat by fans take a piece of this motivational jewelry on the road with them. Three (3) lucky winners will run, ride, or dance away with their favorite piece from the collection. The giveaway is open to residents of the US and Canada. The giveaway ends on midnight EST September 30, 2012. UPDATED: In order for any entry to be valid, you must login and complete your entries using the box below. Simply take a look at the collection and leave a comment telling me your favorite piece in the collection in the box below. You can also tweet about this giveaway for extra entries or become a fan on Facebook if you aren’t already (if you are, you get an easy entry!). I love the Healthy happy strong necklace. Such. Great mantra! Renata – Thank you for your comment. Please make sure to log in to giveaway box (above) in order to have a valid entry. I love the “be mindful” necklace! I’m striving to be mindful of my eating, activity, and attitude. 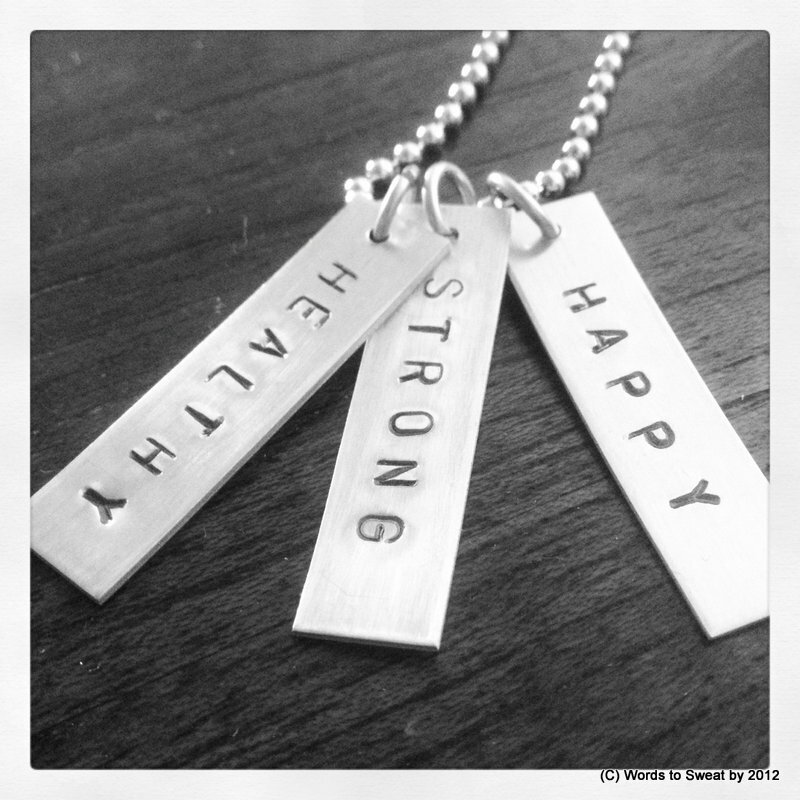 Love the “healthy happy strong” necklace, too! Great inspirational jewelry. I like the No Excuse With Dumbbell necklace. I always have an excuse not to go to the gym. When I’m there, I love how it makes me feel. I have to remember NO EXCUSES!! I like the Eat Clean necklace. Something that I am trying to commit too. I love all of te jewelry. I love the run-distance necklace, but really everything is so adorable! I love the Transform one! I love the “Transform” bracelet– a constant motivator right on your wrist where you can’t miss it!! LOVE the Transform bracelet. It’s spot-on for me right now! I am ALL ABOUT the FIERCE necklace! Although I also like the PATIENCE bracelet. I love the faith bracelet-but all of it is so cute! I haven’t really seen anything like it! I really like the patience bracelet. Also the fierce necklace. Thank u for the great giveaway!!! My favorite is the Necklace: No Excuse With Dumbbell because with a necklace I could look down and see the barbell for motivation and inspiration. I can’t decide which is my fave! I like Beast Mode necklace, but the Patience bracelet is cool too! I love the Run+Distance necklace. I’m building a half marathon charm bracelet and that would be a perfect fit! The purple transform is the best ever!!!! LOVE IT so very much!! The no excuses with the dumbbell necklace is my favorite. The “Fierce” necklace is by far my favorite–so awesome! Love the Happy Healthy Strong necklace! I love the Necklace: Healthy. Strong. Happy! I love the Lift Bracelet. I love all your jewelry, it’s beautiful. I like the TRANSFORM bracelet!